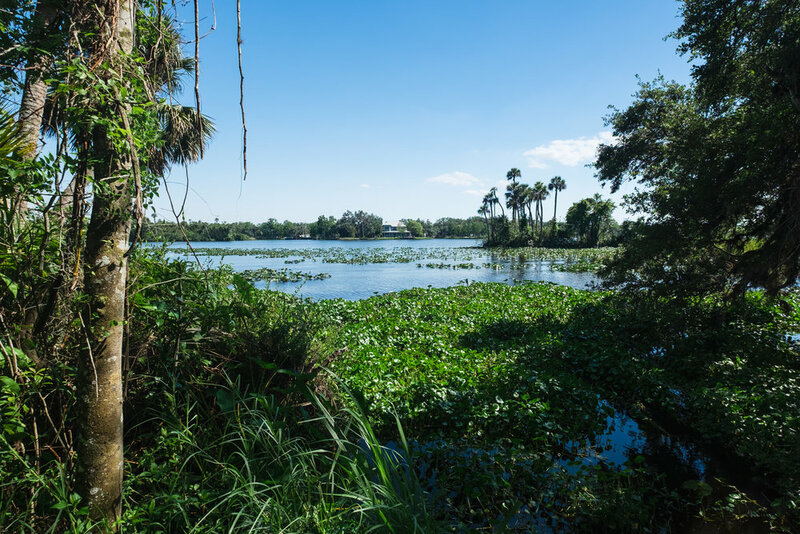 If you've been following us for awhile, you know we LOVE hidden gems. Locations that are totally off most peoples' radar, destinations that most couples our age haven't been, places that are actually REALLY awesome, but no one really knows! Well friends, we're about to let you in on a little secret. The Fort Myers and Sanibel area is exactly that. It's the perfect mix of small town vibes and tropical island flavor. 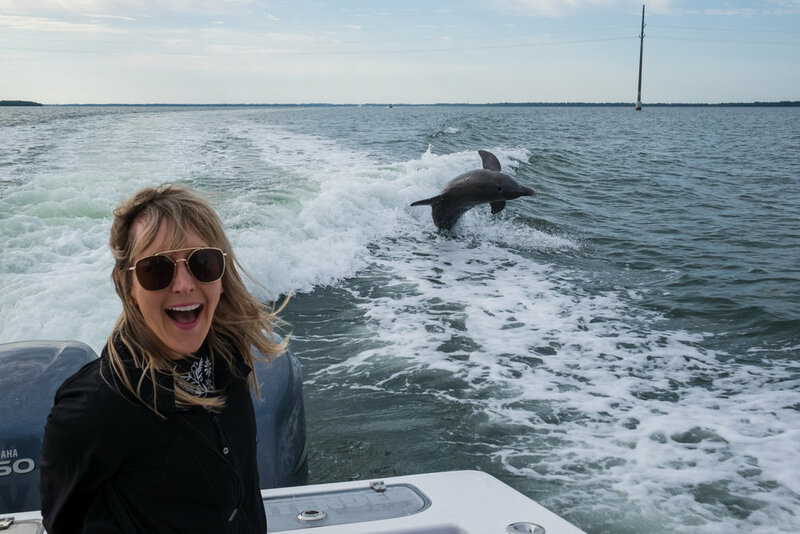 You can boat next to jumping dolphins, float in warm, turquoise waters, and sip mai-tai's all the while looking for manatees. Need we say more? Here's our guide for spending a weekend in these quaint, quirky, and picture-perfect seaside towns. We arrived on Sanibel Island in the afternoon, checked into our hotel, (the Sanibel Marriott) and went straight to Billy's to rent bikes. Nothing sounded better after a long flight than a sunny bike ride along the Sanibel Lighthouse Beach. Sanibel as a whole is super bike-friendly and easy to navigate. Sunny weather, birds chirping, and the sounds of the ocean crashing in the distance... it was heavenly! 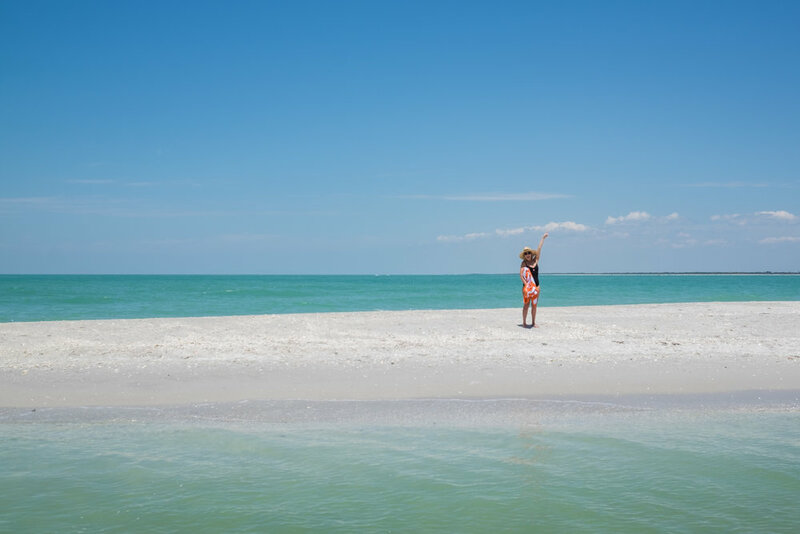 This is one of those Sanibel spots you have to experience. From the colorful ambiance to the extensive menu, it's fun and reasonable and perfectly wacky. Take our advice and order the gater. It tastes just like chicken! Another favorite was their famous mojito - you probably won't be able to order just one! After the Island Cow, we headed to the nearby beach to sleep off our food coma. Make sure you've packed some beach towels, and find a spot along the coast to rest up and relax. We layed out, played frisbee, swam in the warm water, and ended up catching the sunset! Nothing says vacation like an entire afternoon on the beach! The Lazy Flamingo is a local favorite, and for good reason. Their food is delicious and the drinks are affordable. It's exactly the kind of place you want to go after a day at the beach. It isn't pretentious at all, and the people we talked to were really nice. We ended up sharing mozzarella sticks (because, VACATION!) and a caesar salad (because, HEALTH!) and it was the perfect combination! Oh, and make sure you order the Key Lime Pie. It's unreal. One of our favorite places to walk and explore is Fort Myers Beach. From the colorful shops to the beachfront restaurants and bars, it's a lively and funky part of town. We love heading there early in the morning so we can stake out a good spot! Take a walk along the pier, down the coast, around the shops. Then head straight down the street until you hit... MoJoe's! The colorful building and cool marketing instantly caught our eye, and when we saw the breakfast menu, we were sold! MoJoe's is an order at the counter type of restaurant. No frills, just great food, delicious coffee, and a cozy little outdoor patio. Done and done! Did you think we would vacation in Fort Myers/Sanibel and NOT spend some time at Lover's Key? Come on, this place was basically named for us!! And it's a beautiful coastline. We spent a few hours collecting seashells (Check out our blog on seashelling from our last trip here - we learned a TON), playing beach games, and working on our tan. Oh, and we snuck some kisses in too... Because helloooo, it's called Lover's Key! The tropical vibes are strong at Coconut Jack's, and we couldn't have loved it more. Ask for a table on the patio (right on the water! ), order one of their famous tropical drinks, and relax as you watch fish jump in the Fish Trap Bay. Bobby was freaking out because he kept barely missing catching a fish jumping on camera - maybe next time, hehe. Whether you order the burger or the Mahi-Mahi tacos, you can't go wrong. Everything at Coconut Jack's is good! There's something really charming about Downtown Fort Myers. We started with a cup of coffee at Green Cup Cafe, then perused the streets and did some window shopping until we were hungry. The town is bustling and lively - we saw young couples, families, and even bachelorette parties! There's something for everyone in Downtown Fort Myers, and the restaurant selection is no exception. There's a variety of cute and colorful restaurants with plenty of outdoor seating, and many with live music. We opted for something original for us - pizza! Capone's is a Fort Myers staple, a pizzeria with incredible coal-fired pizzas. Go! We wish we had another few days to explore more of the food here! Are you ready for the best day you'll have all year? Rent a boat (and/or a driver!) and spend your Sunday on the open seas. Leave early, giving you plenty of time before lunch to spot dolphins and other sea creatures. We drank mimosas, flew along the water with dolphins, and watched as the sun became brighter and the ocean turned the most perfect color of blue. Before we knew it, it was lunch time! Eat lunch at the historic and quirky Cabbage Key. The food is great (we blogged about it a couple years ago here), there's cash all over the walls inside (literally), and the tiny island is beautiful (this time we hiked up to the top of a little water tower). Make sure you stop there! Before this trip, Alli didn't even know what a sandbar was. Now, it's all she can talk about! 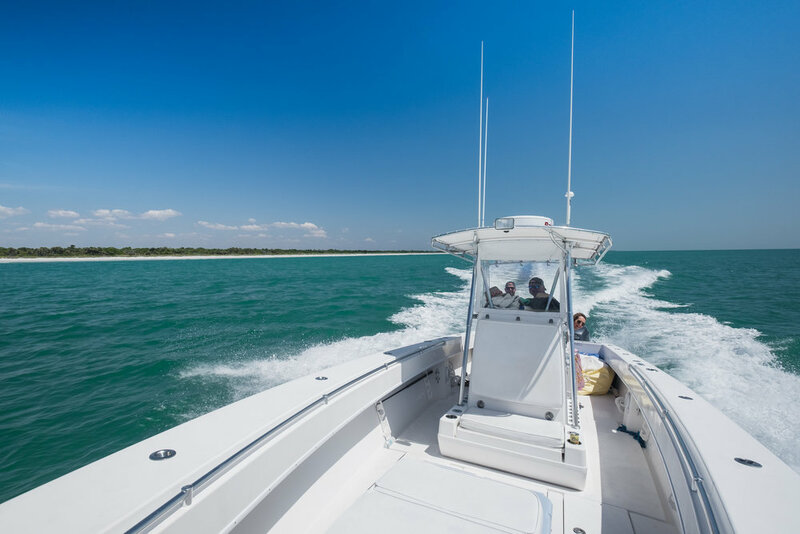 Due to weather and changing tides, sandbars in the Fort Myers/Sanibel area come and go, but we were lucky enough to find one in North Captiva (we'll be sharing some EPIC photos from this spot in a few days - stay tuned). It was the perfect spot to anchor our boat and spend a few hours soaking up the sunshine! Finish the day with an early dinner at a fan favorite spot, Barnacle's. Leave your boat at the festive dock, grab a bucket of beers (or their yummy house-made sangria), and relax as you watch the sun slowly set along the water. Enjoy their fresh fish and famous rice and beans, and treat yourself to their homemade ice cream upstairs. Can you think of a better way to end the evening?! We don't think so. Coined the "World's Best Breakfast", and being breakfast FANATICS, we couldn't think of a better spot to end our trip! Located in Sanibel, The Lighthouse Cafe is a cozy and quirky little cafe that is filled to the brim with lighthouse trinkets and pictures of lighthouses... and it's absolutely adorable! They have almost as many breakfast items as they do lighthouses (almost), and from what we saw on the tables surrounding us, ALL of it looked amazing! We ordered eggs and bacon, Eggs Benedict, and a plate of their famous pancakes... and needless to say we almost needed to be rolled out of the restaurant! "World's Best Breakfast" might be a lofty statement, but they just might be right - it was really delicious! After the yummy breakfast, we took a short walk on the beach before heading to the airport. While we were sad to leave, we knew instead of a farewell it was more of a "See you soon, Sanibel (& Fort Myers)". We can't wait to return and explore other spots and keep this list going, so if you have anything to add... feel free to comment below! We'd love to hear!